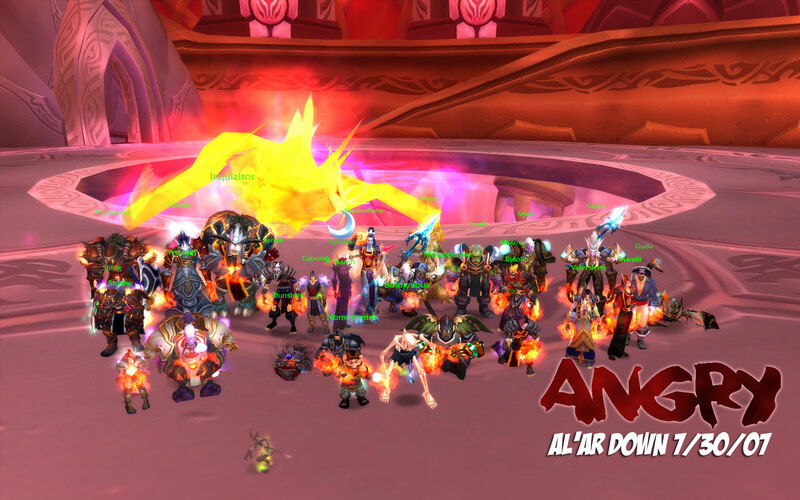 Tonight saw the end of Al'ar, prized pet and trophy of Prince Kael'thas Sunstrider in the arcane sanctum of Tempest Keep–and Akama's plans took another step forward. The eternal corpse yielded a [Talisman of the Sun King] for Delurs and a [Netherbane] for Morteunious. Shortly after midnight the Coilfang Matron, Lady Vashj, lieutenant to Lord Illidan Stormrage was slain. Congratulations to Bunsters on [Vestments of the Sea-Witch], Thrush on both a [Rift Stalker Helm] and a [Serpent Spine Longbow], and Astanni on a [Crystalforge Greathelm]. Next week we're killing her hair! Leotheras proved to be no match for your resident superheroes despite suggestions to the contrary. He fell in a flurry of blades and magic blasts alongside his demonic tormentor shortly after 10:00, and for our efforts we were rewarded with [Orca-Hide Boots] for Delurs, [Cataclysm Handgrips] for Uki, and [Rift Stalker Gauntlets] for Jehdin. The way to Lady Vashj is clear! 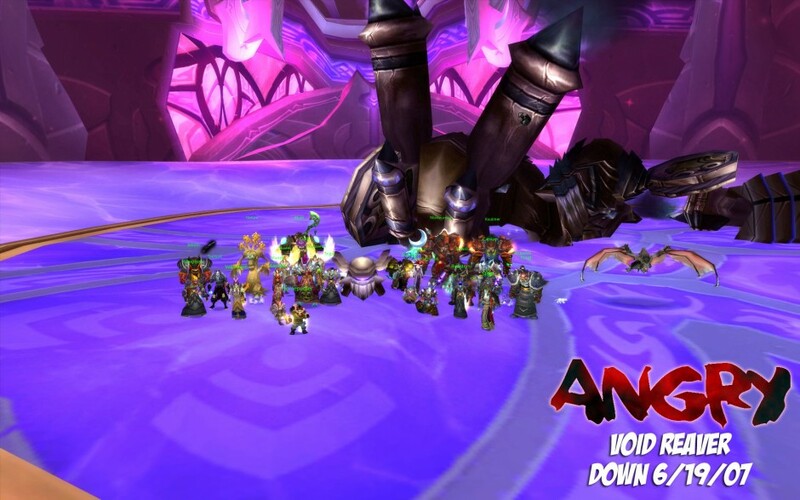 The fallen Highborne is next! This whirling dervish took his last dive shortly before midnight tonight making the scalding waters of Serpentshrine Caverns his final resting place. The aftermath of the fight yielded Raubtier's corpse, [Boots of Effortless Striking] for Beleth, and [Velvet Boots of the Guardian] for Tegal. The Demon-Hunter, Leotheras, is next! 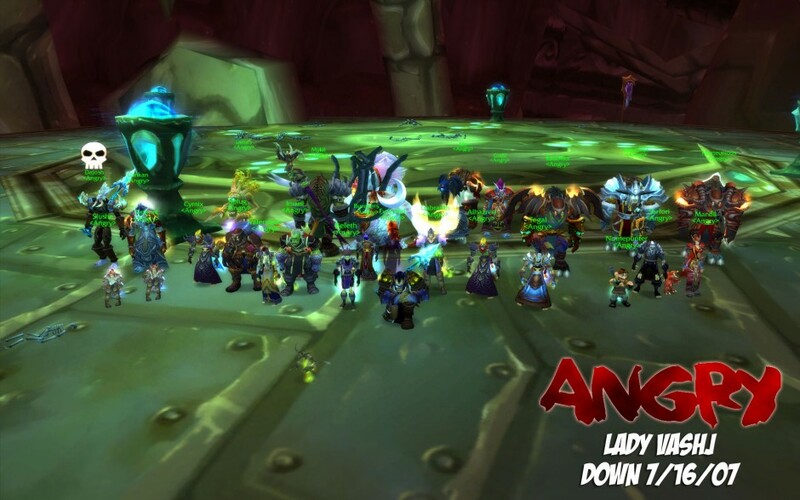 Fathom-Lord Karathress and his crew fell tonight beneath the resurgence of the Angry Horde. In his wake was found a [World Breaker] for Splug, [Destroyer Greaves] for Nomepunter, and [Destroyer Legguards] for Morteunious. 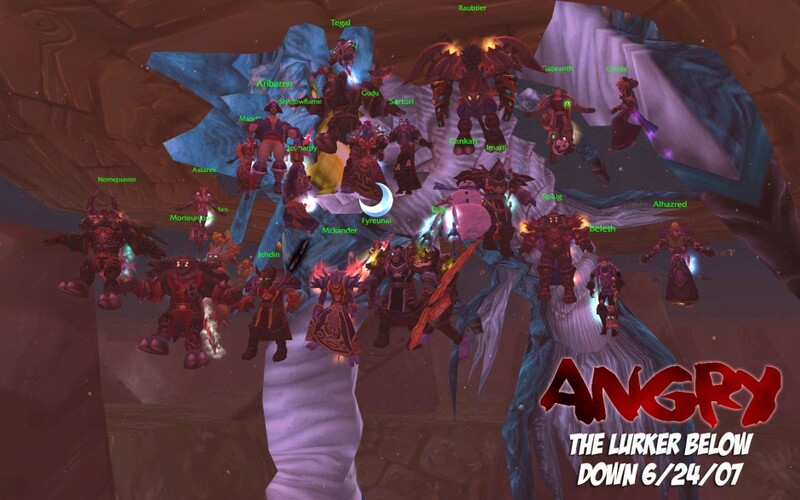 Another day, another kill–on to the Lurker Below! We finished raiding at 10:00 and a random suggestion that we go play with trash in Tempest Keep yielded a Void Reaver kill. Overall a good encounter, quick to learn and fun to complete. The Void Reaver left Thrush with a pair of [Void Reaver Greaves], Mandii with [Mantle of Tirisfal], and Raubtier with [Destroyer Shoulderblades]. Congratulations and welcome back, Angry! This evening saw Morogrim Tidewalker into his own watery grave and opened the way to the Fathom-Lord, Karathress, and his Broken entourage. And the Democrats say there's a recession, hah! Morogrim dropped [Pauldrons of the Argent Sentinel] that went to Nomepunter (yeah, he's a Warrior) and a [Pendant of the Lost Ages] to Alhazred. After a brief break from raiding, Angry has made a return to Serpentshrine. With a couple nights of relearning the encounter, Hydross was quickly and cleanly dispatched tonight. Nomepunter will be going home with ever stylish [Pauldrons of the Wardancer] and Gudu with the [Fathomstone]. Onward to Tidewalker! 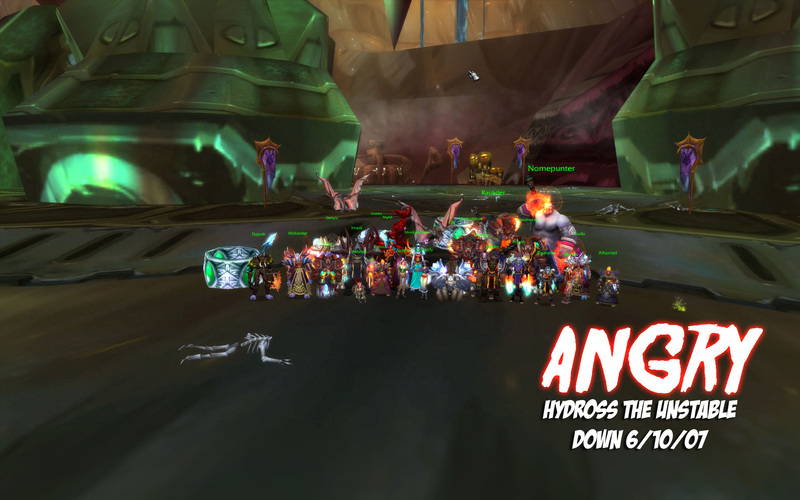 On an unrelated note, as of last week Angry has been present and raiding on Illidan for two years. Happy birthday, guildtag! 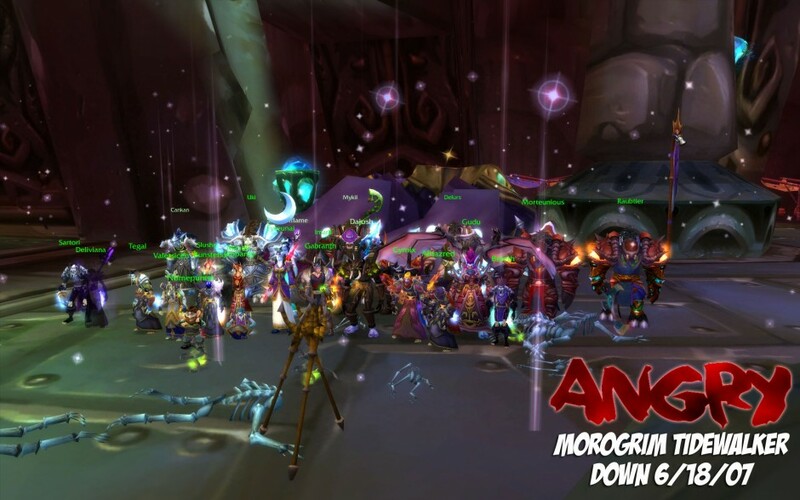 The true end of the Fel Horde! 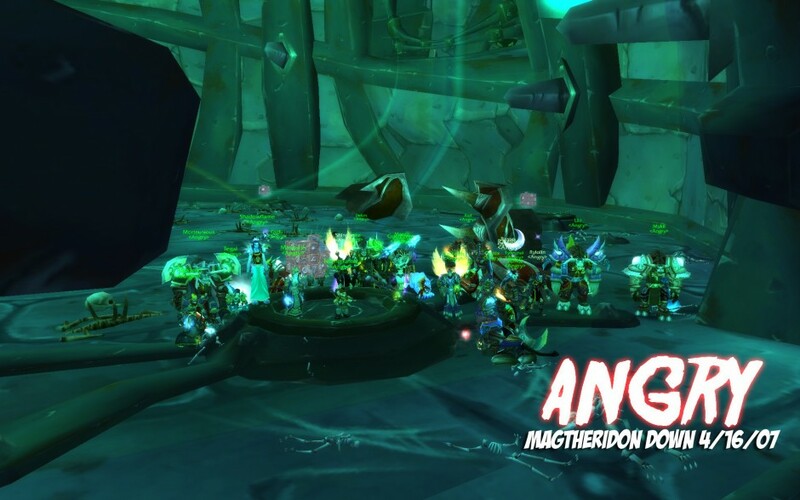 In the depths of Hellfire Citadel's terrible Blood Furnace resides the unholy corruptor, Magtheridon, the final source of Illidan's menacing Fel Horde. At least–that's what used to be there. 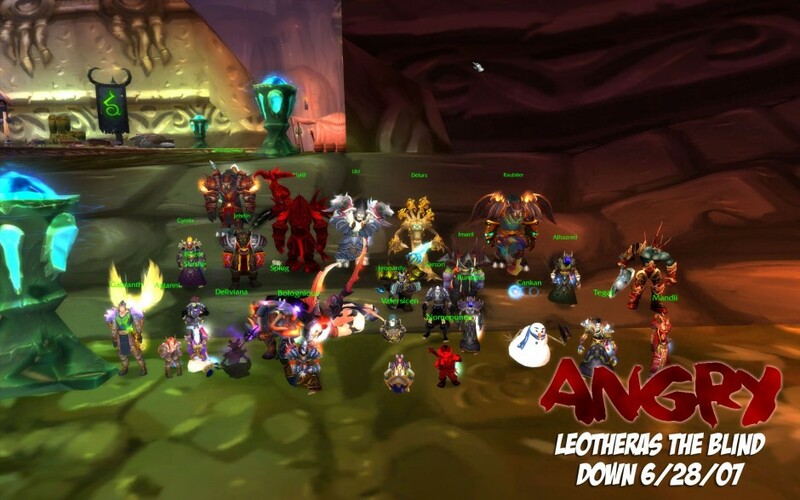 Tonight, Angry's elite ventured into the prison lair of the captured demonlord and shortly after setting him free of his mystic bonds, was he slain. As is customary when a foe of this nature is vanquished, his corpse was sundered and searched until the following was found: [Crystalheart Pulse-Staff] to Fyreunai, a [Cloak of the Pit Stalker] to Raubtier, and a [Warbringer Chestguard] to Splug. 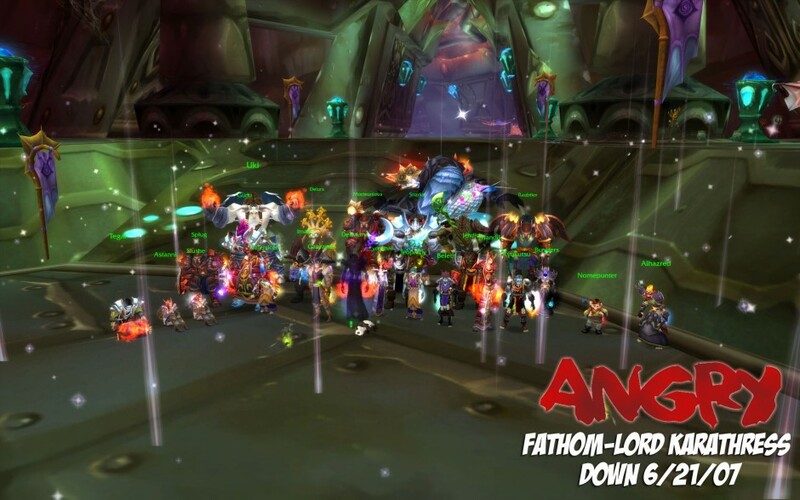 And the Fel Horde would wither and die. 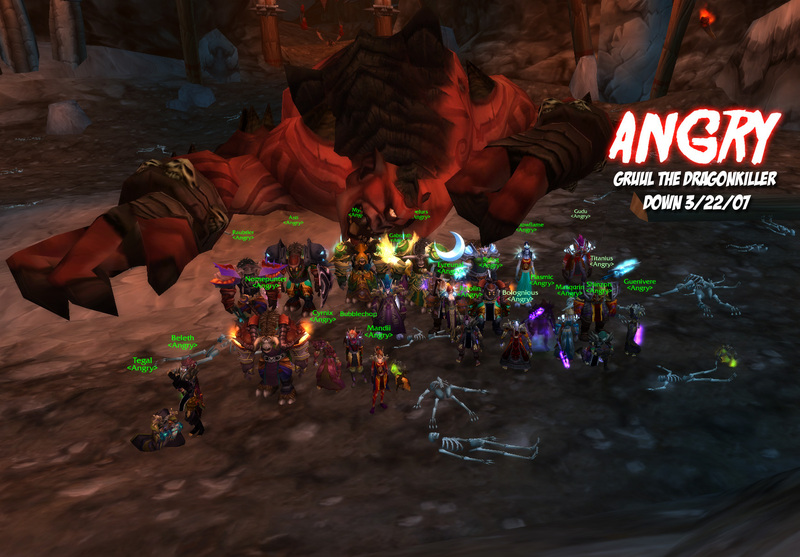 A last minute decision to venture into Gruul's Lair rather than make groups for Karazhan yielded a Gruul the Dragonkiller kill. Loot was [Demon Stalker Greaves] to Titanius, [Eye of Gruul] to Fyreunai, and [Gauntlets of Martial Perfection] to Nomepunter. Alas, my wayward apprentice has been slain. See you in Serpentshrine!